I left Moratinos after a wonderful stay with Rebekah and Patrick at Peaceable Kingdom, a special retreat for pilgrims who have crashed and burned so to speak. Four days spent there did me a lot of good. 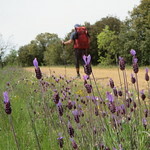 With a renewed outlook on my Camino, I walked to the city of León with my friend Eric, who was passing by. We went our separate directions in Leon. He carried on to Santiago and I detoured onto the Camino de San Salvador route towards Oviedo for 5 days, 125 kilometers. Be sure to check out my San Salvador gallery!